A proposed new quarry causes three scientists - Rachael, an expert in birds, Anne, a botanist and Grace, a mammal expert - to be called in to do an Environmental Impact Assessment on the site. The three women are staying in a cottage near the site. However, on Rachael's arrival at the cottage, she finds one of the neighbours, Bella, an old friend of hers, had committed suicide in a barn. A couple of weeks later, Grace is found murdered. Detective Inspector Vera Stanhope is called in at this point. The Crow Trap is the first mystery featuring DI Stanhope, who is a fairly unusual detective. She has been described as a female Morse or Jack Frost, which is true to a certain extent. She is not interested in what other people think of her, and is described as looking like a bag lady at one point. She is, however, an intelligent detective, and I look forward to more mysteries featuring her. The structure of the book is interesting - the first part describes the same events, from Bella's suicide to Grace's murder, three times, once from the point of view of each of Rachael, Anne and Grace. We therefore see each of the women from both their own point of view, and that of the other two. Some of the backstory of each woman also becomes clear in each version. After this, the narration becomes more general, before later focussing on DI Stanhope's point of view. I was a little surprised at the number of female characters in the book, as it seemed very high. But I was a bit chagrined to realise I would not have found anything amiss if the ratio of male to female characters had been reversed. The mystery was intriguing, involving as it did the backstory of various characters. The characters were well-drawn and clearly differentiated from each other. I would recommend it to anyone who is interested in more character-based mysteries. I became interested in this very unique and picturesque woman detective after watching the PBS series. When I found the first book in the series at a wonderful used book store, I had to buy it. Vera Stanhope is a wonderful fictional character. And Ann Cleeves does a fine job of drawing this character as well as the many other strong characters in this book. I loved the setting as well - Northumberland, England and Ms. Cleeves descriptions of the countryside and of the North Pennines are very realistic. It is an area of England that I'd love to visit some day. This is a detective story that is certainly different than your run-of-the-mill detective stories. It is complex and detailed and punctuated throughout with Vera's unconventional style of investigation and her acerbic personality. This was a book that was a pleasure to read. It was a novel that kept me fully involved and immersed in the wonderful story that Ann Cleeves has created. I can't wait to read the next book in this truly engaging series. 1st outing for Detective Inspector Vera Stanhope. Police procedural set in the North Pennines - OK but thought this crime procedural was overlong and we aren't introduced to the main character, Vera Stanhope, until well into the story. The first book in the Vera Stanhope series begins with sections about three women who are staying at an isolated cottage in the North Pennines of England. Rachael, Anne and Grace are conducting an environmental and ecological review which will be used to determine whether or not the area can be developed into a quarry. When Rachael arrives at the cottage she discovers the body of close friend Bella Furness, who appears to have committed suicide, a verdict Rachael refuses to accept. When another death occurs, a fourth woman enters the picture, the unconventional Detective Inspector Vera Stanhope. Vera is not your usual police inspector. Her mother died when she was still a young girl, and she grew up with her bird-obsessed father, living with him until his death. Vera has learned the value of patience, standing still, and observing and listening. These skills are all put to good use during an investigation in which everyone has something they want to remain hidden. Book Description The Crow Trap is the first book in Ann Cleeves' Vera Stanhope series -- which is now a major ITV detective drama starring Brenda Blethyn, VERA. Three very different women come together at isolated Baikie's Cottage on the North Pennines, to complete an environmental survey. Three women who each know the meaning of betrayal ...Rachael, the team leader, is still reeling after a double betrayal by her lover and boss, Peter Kemp. Anne, a botanist, sees the survey as a chance to indulge in a little deception of her own. And then there is Grace, a strange, uncommunicative young woman, hiding plenty of her own secrets. Rachael is the first to arrive at the cottage, where she discovers the body of her friend, Bella Furness. Bella, it appears, has committed suicide -- a verdict Rachael refuses to accept. When another death occurs, a fourth woman enters the picture -- the unconventional Detective Inspector Vera Stanhope ...Also available in the Vera Stanhope series are Telling Tales, Hidden Depths, Silent Voices and The Glass Room. Ann Cleeves' Shetland series (BBC television drama SHETLAND) contains five titles, of which Dead Water is the most recent. 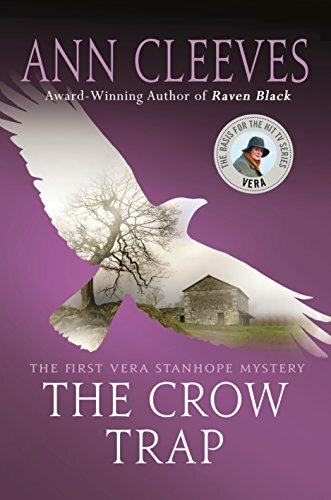 THE CROW TRAP by Ann Cleeves is the first in the Vera Stanhope mystery series. I was prompted to begin this series after reading Ms. Cleeves’ Shetland series. I am a huge Ann Cleeves fan. I realized she was the author of the very popular ‘Vera’ books and that an equally popular British TV series starring Brenda Blethyn was based on the Vera Stanhope mysteries. I had to get started reading! There is nothing I like more than ‘binge-reading’ a good mystery series. I liked the book but I didn’t get much of a ‘take’ on Vera Stanhope, as she didn’t appear ‘till half-way through the book. I have read and heard that the following books delve more deeply into the ‘Vera’ character. Vera lives and works in Northumberland (northeastern England). She is extremely cranky, opinionated, insightful, messy and very insensitive of others. I would have liked more scenes with her long-suffering assistant, Joe Ashworth. I assume he will be ‘fleshed-out’ in later titles. A great sense of place; a many-layered plot; complex characters; mystery and suspense make this an excellent introduction to a great mystery series. Three women are hired to complete an environmental study on the countryside where a new quarry operation is proposed. Ann Preece, Rachel Lambert and Grace Fulwell all seem to be brilliant naturalists, but all three are full of secrets, insecurities and somewhat troubled pasts. There are many questions. What prompted Bella to take her own life? Who is in favor of the quarry? and who is against it? and for what reasons? What connection does Vera have with this area? Where is Grace’s father? Vera is an excellent listener and is very insightful with others. She particularly understands her home turf and knows that the past often influences the future in very unexpected ways. I enjoyed the twists and turns in the story. The characters were interesting especially the lead police detective. The back and forth keeps you guessing until the end. This was an interesting introduction to the Vera Stanhope series, who is rather a unique character. It encompassed an interesting mystery that threw in a number of twists. I didn't work out who the guilty party was until just before the end of the book. I look forward to reading on in this intriguing series. The lives of various women intertwine in this tale of ecology vs business, secrets vs privacy, and mystery in the northern Pennines. Each woman has a tale to tell in this novel, told from several different points of view; but not every woman survives to reveal all. And so the mystery grows, under shadow of hills, and guarded by crows. The real-world crow trap invites its prey with a captured bird. But who is prey and who is predator here? Ann Cleeves creates her cast of characters and their relationships convincingly and enthrallingly, introducing Vera—protagonist now of her own TV series—very quietly and giving great depth to the character I’d previously only known from TV. Fans of the series will recognize hints but the story’s still vivid and new—after all, the books did come first, and I’m eager to read more. Starts out rather slow and a bit confusing but ends up being an enjoyable murder mystery. Recommended. Especially recommend the audio version, the narrator did a great job.